Abstract—Many theoretical and experimental works are made on the wurtzite phase of indium nitride (InN), gallium nitride (GaN), aluminum nitride (AlN), and their alloys. On the other side, few experimental data exist for their cubic phases whereas theoretical studies show they are performing more interesting.The purpose of our paper is to study the electron transport within bulk cubic InxGa1-xN, using the method of Monte Carlo simulation.We start by an introduction, and then we present some electron properties of the binary compounds, GaN, InN, AlN, and those of the ternary, InxGa1-xN. In the third section, we give an outline of the method of Monte Carlo simulation. In the fourth section, we calculate the steady-state electron transport in InxGa1-xN, especially the electron drift velocity versus applied electric field, for different percentages of indium in this alloy, at various temperatures. We consider in our simulation, the following scattering mechanisms: acoustic phonon scattering, nonpolar optical phonon scattering (equivalent and nonequivalent intervalley), polar optical phonon scattering, ionized impurity scattering, piezoelectric scattering, and alloy scattering. To validate our results, we compare with some published results and are in good agreement. Index Terms—InxGa1-xN, electron transport, electric field,temperature, Monte Carlo. A. Hamdoune Unity of Research “Materials and Renewable Energies”,Faculty of Science, University of Abou-bekr Belkaid, PO Box 230, 13000,Tlemcen, ALGERIA (phone: 00213-43-28-56-86; fax: 00213-43-28-56-85;e-mail: d_hamdoune@yahoo.fr or ahamdoune@gmail.com). N. Bachir Unity of Research “Materials and Renewable Energies”,Faculty of Science, University of Abou-bekr Belkaid, PO Box 230, 13000,Tlemcen, ALGERIA (e-mail: nadia_bachir@yahoo.fr). 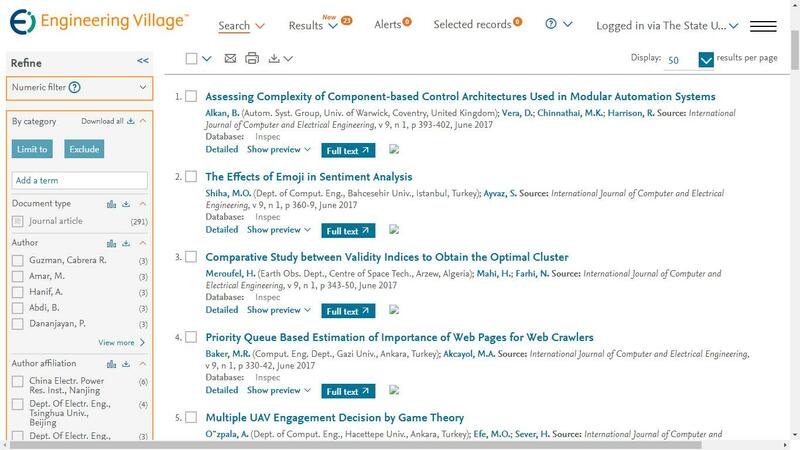 Journal of Computer and Electrical Engineering vol. 2, no. 5, pp. 891-895, 2010.